Hi all b’ful IMBB ladies, I love scrubs. They are my instant pick-me-ups. In fact, I like them better than face packs, because they are faster. Scubs can give you an instant glow and regular use polishes your skin. I used Everyuth’s Walnut-Apricot scrub for sooooo long that I got bored of the whole idea. I wanted to switch, but almost all other brands had Apricot or Strawberry scrubs. I was dead bored of Apricot and I am not a big fan of Strawberry flavour. So I was just not finding the right scrub. What is “Jovees Papaya and Honey Facial Scrub”?? This mud-based scrub is a unique formulation contains Papaya Seeds, Honey, Fenugreek, and Margosa as the key active ingredients that help to discover a new kind of luminosity day after day. This scrub is a deep pore cleanser that wipes away spent surface cells, revealing a smoother, clearer and refined complexion. Moisten face and neck. Apply all over the face and neck. Massage gently with fingertips for 2-3 minutes using anti-clock and clock wise strokes. Leave on for five minutes. Rinse thoroughly and pat dry. Follow with Jovees Day Cream. The first time I used this, I used it like any other scrub. I moistened my face, scrubbed and washed. My skin was instantly soft and smooth. Then, I read the pack info. The next day, I scrubbed and left it on for 5 minutes. The difference it made was startling. My skin was sooooo soft and smooth; that I, perhaps the person with the driest skin, did not apply moisturizer on top. I sprayed rose water (mine also has glycerin) and I was done. Looking fresh and glowing!!! The grounded papaya seed serve exfoliation purposes. Also it is a mud based scrub which is ideal for all types of skin. Mud purifies and deep cleanses skin. It has natural minerals and anti-oxidants which are fabulous for skin. Unclogs pores and absorbs excess oils. As mentioned above, it does not have those typical scrub ingredients. I like the packaging. The tube is fresh lime green coloured. Though it is not citrusy at all. 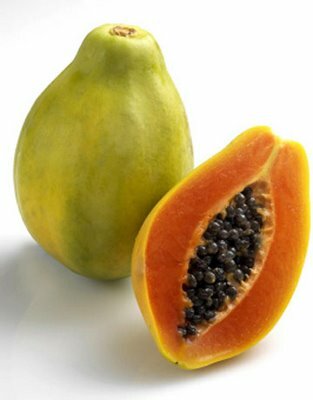 Papaya and honey are natural emollients. When I leave it on after scrubbing, the creamy formula somehow, gets absorbed into my skin, moisturizing from within. Many scrubs I have used before have dried my skin further. It contains papaya seeds as the scrubbing particles. Although they are abrasive enough to make a good scrub, they do not scrape my skin. I can and am using it daily. It just makes my skin softer and softer. It smells very different. It’s neither like Papaya nor honey. The fragrance is mild and refreshing. It is priced decently. Rs. 155/- for 100g. The shelf life is 3 yrs. Although I am gonna use it up much faster. It lasts really long. I am using it for over 6 weeks and the tube has enough product to last me 2 more weeks. I can actually see a glow on my face after using this. I don’t dislike anything about this product. It is just perfect. I am gonna buy it again and again till of course I get bored. Then I may shift to their Almond and Apricot Scrub. Jovees also makes some great face packs. I am using their 30+ youth pack and it is quite good. Maybe I’ll review it later. All in all; it is a good product and has become my go-to, whenever I have a skin trouble. It is also quite efficient in removing face makeup. P.S. I wrote this article before my engagement. So just wanted to say…. I missssseeeeeddddd aaaalllll of you!!!! It’s soooo goooood to be back!!!! And a huge thank you and tightttt hugs to Rati for the beautiful wishes on IMBB!!! My (smaller) big day was so much fun because of all your best wishes…. Thank you!!!! m buying it for sure !!! Trust your review.Will try this out soon. Will definitely let you know how I felt about the product and whether it worked for me or not. this is my holy grail scrub. i’ve used it twice in the past and am using something else at the moment, but my mind just keeps going back to this babe. mrunmayee, you’re right that this doesn’t have any drawback. didn’t you find this finer, thicker and pastier than other scrubs? the rest are so runny. i however, could not use it everyday. rati, this is the jovees scrub i was talking about in your forum. i think i mentioned some other scrub type, but it was this one. the name must have slipped through my mind. I think after reading such good comments abt this one from u n Rima I will definately give this one a try…. You know Mrun…..my skin becomes so happy with papaya……there is nothing that suits my skin like papaya……I have heard a lot about Jovees and BTW, thanks for giving out the website………..i am going to check this out……. You have oily skin no Jomol… Try the one for Oily skin and give us a review…. I am 23 years old. I have normal to dry skin. can I use jovees papaya Honey scrub???????????? I am going to use scrub for the first time. I have a very sensitive oily pimple prone skin.Can you gals suggests any scrub which will b best 4 my skin type. I have some products in mind but too confused to choose them :biotique papaya scrub. jovees papaya scrub and Fabindia Neem Tulsi Face and Body Gel Scrub.